If you’re trying to make sure that your RV feels as close to a home on wheels, then one of the most valuable things that you can own is a soft, comfortable mattress. If you can’t get a good night’s sleep while on the road, then you’re not going to enjoy your time out and about. With that in mind, we want to take a look at the best RV mattresses on the market today. Because sleep is such a vital part of the traveling experience, we want to make sure that you’re more than satisfied with where you lay your head. Let’s see what these mattresses can do for you. When comparing the best RV mattresses, you can either buy something that is specifically designed to fit into a motorhome or buy a regular bed that will fit into the particular dimensions of your rig. For the most part, unless your RV has some unique specifications, I highly recommend buying a regular mattress and installing it inside your mobile home. Since comfort and reliability are essential to a good night’s sleep, going this route will usually yield better results. So, in this case, we have the Serenia Sleep Mattress. This is one of the best-quality models you’ll find, whether you’re searching for a bed for your RV or not. Let’s see how it can help you fall asleep on the road. More than anything else, the thickness of your mattress will dictate how comfortable it is. If it’s too thin, then you’ll wind up compressing it and making it almost worthless. If it’s too thick, then you may not be able to fit it inside your RV, which also renders it moot. At eight inches, this bed should fit into almost any motorhome with ease. You can choose from nearly any standard mattress size, so unless your rig is unique, you shouldn’t have any problems fitting it inside. The top layer of this bed is made of open-cell memory foam, making it super comfortable and inviting. While standard memory foam can sleep hot and sometimes have a strong odor, this particular version is designed to help you stay cool at night by allowing air to flow through. Beneath that layer is six inches of high-density foam. While this material is thicker and firmer than the top, it’s built to support your body and retain its shape much more reliably. If the whole thing were memory foam, you would have trouble getting out of bed after just one night. Combined, these two layers are extra supportive and extra comfortable. If you’re used to sleeping on an innerspring mattress or something less accommodating, you’ll be impressed by this bed. As I mentioned, one of the most significant issues with standard memory foam is that it can insulate your body, causing you to sleep hot and wake up soaking in sweat. Fortunately, this particular mattress helps alleviate the problem by having open cells that allow air to move through them, which can regulate your temperature at night. Another problem that many people have with foam mattresses is that they tend to be made of a lot of harsh chemicals and ingredients. While these beds are certainly less eco-friendly than some, the Serenia Sleep is CertiPUR certified. If you’re not familiar with this certification, it means that there are no harmful elements included with this mattress. No harsh flame retardants or other chemicals are inside, meaning that you can sleep soundly without having to worry about being exposed to something dangerous. Although not all foam mattresses come with this labeling, I prefer to seek it out so that I can rest easy at night (literally). When it comes to comfort and reliability, I really like this bed. Although eight inches may not seem like a lot, it’s more than sufficient to help you sleep better at night, particularly when you’re on the road. I also like that the top layer helps regulate your temperature, as well as the fact that this mattress retains its shape better than most others in its class. Overall, when looking at different foam mattresses, a lot of the benefits are subjective. While I may feel great sleeping on this bed, other people may think that it’s too firm to be comfortable. I would highly recommend testing the mattress for a few nights to see how it feels before committing to anything (if possible). Although I typically like thinner foam mattresses, I know that many people prefer to have something thicker to sleep on at night. If that’s the case for you, you’ll probably like this model from Zinus. Again, we have another mattress that isn’t specifically built for RVs. That being said, you know that you’re getting a high-quality model, thanks to the comfort and resilience of the Zinus brand. Let’s see what you can expect from this mattress. Because the thickness and types of foam used for your bed are going to be the most crucial aspects of its comfortability, I’ll be breaking down each mattress by layer so that you can get a better understanding of what it will feel like. In this case, we have a triple-layered bed that not only cradles your body but helps you sleep cool at night. The top layer is standard memory foam, which is remarkable for its adaptive properties. Once you lay on this mattress, you’ll feel like you’re sleeping on a cloud. Below that is two inches of comfort foam. Although this material is similar to memory foam, it’s better designed to cradle your body, as well as bounce back to its original shape. When you combine the two top layers, you’ll wonder how you ever slept on anything else. The final 5.5 inches is high-density foam. As usual, this material is there to provide additional support, as well as help the mattress retain its shape over time. Compression is one of the most prevalent issues with foam beds, so having this layer helps out a lot. Although this mattress is not CertiPUR certified, it does come with natural materials in the top layer. Thus, you can rest easier knowing that you’re sleeping on something that is a bit more eco-friendly than most other mattresses. The secret is Biofoam, which is the eco version of standard memory foam. The top layer is made of this stuff, meaning that you’re not exposed to harsh or dangerous chemicals. Overall, when comparing this mattress to others, it’s much more comfortable than you might expect. Because it’s thicker and has more layers, you can rely on its comfort much more than you would with other beds. I also like the inclusion of Biofoam in the top layer. Since most foam mattresses are far from environmentally friendly, having this material helps me feel better about sleeping on this bed. One issue that I didn’t cover with memory foam mattresses is that they can sometimes take a while to decompress. Since these beds are typically rolled up for easier shipping, you have to let it unfold for a few days before you can get the full experience. Another downside to this particular bed is that it can start to flake after a while. If and when this happens, it could cause an allergic reaction. The cover it comes with helps deflect this problem, but it can still affect you while you sleep. So far, we’ve been looking at mattresses that aren’t necessarily built for the RV life. However, if you’re worried that such a bed won’t fit into your mobile home, you may prefer something like this model from Vooco. Although the dimensions are slightly different, you still get some incredible comfort and resilience with this bed. Let’s see how well it stacks up with the rest. At ten inches, this mattress is more than sufficient for most sleepers. However, when you break down the three different layers included, you’ll be more than impressed with the results. On top, we have regular memory foam. As I’ve established so far, sleeping on this material is like a dream, thanks to its natural adaptive properties. When compared to other foams or a standard innerspring model, you’ll feel so much better and fall asleep much faster. Because memory foam can be relatively insulating, the middle layers are made of open-celled ventilated foam. This material ensures that you don’t wake up in a pool of your own sweat, and they can make you that much more comfortable when going to bed at night. As usual, the bottom layer is made of high-density foam. However, with this particular bed, you only get three inches of the stuff. The relative thinness of this material means that this mattress is not as firm as others that we’ve seen. So, if you’re worried that you will feel uncomfortable on a bed with thicker foam, this may be the perfect option for you. As we’ve discussed already, one issue with memory foam is that it can contain some less than desirable chemicals and elements. Because of this, you may experience some allergic reactions when sleeping on it. Fortunately, that’s not as much of a problem with this bed. Not only that, but it helps repel dust mites and other irritants that may take hold inside the mattress, helping you breathe and sleep easier at night. Although most standard beds should fit into your mobile home with few issues, that may not always be the case. Thus, if you want to be sure that your new mattress won’t be spilling over the sides or taking up too much space, having something designed for the RV life will be a much safer bet than the alternative. Because of its thickness, I think that this particular mattress is going to be much more adaptable and comfortable than most of the other options on this list. Also, because it’s designed for RVs, you know that it will fit into your motorhome much easier as well. I also appreciate the fact that it’s both mite resistant and hypoallergenic. Sleeping on memory foam can be a problem for some people, so these features will help alleviate that issue. Because there isn’t as much high-density foam on the bottom, this bed may be too soft for some people, particularly those who weigh more. Also, even with the airflow layers in the middle, this bed can sleep hot at times, so keep that in mind. So far, we’ve been looking at relatively thin mattresses of either eight or ten inches in depth. However, if you’re still worried that that may not be enough to cradle your body effectively, we have this massively thick bed from DynastyMattress. Compared to the other options on this list, this bed is both massive and extra adaptable. Let’s see how it fares. One thing to keep in mind with a mattress this thick is that it will be heavier and bulkier than other models. Thus, you’ll want to do some measuring in your RV before buying this bed so that you can be sure that it will fit. Assuming that it does, here is the breakdown of the two layers included with this bed. On top, we have gel foam. Compared to standard memory foam, I really prefer gel versions because they sleep a lot cooler and they are much more comfortable overall. Also, they don’t retain dust mites or allergens, making them even more hypoallergenic than usual. With this mattress, you get nine inches of high-density foam, which is a lot more than most. For some people, this means that the bed will be much too firm, but I don’t think it’s that much more noticeable. That being said, having more high-density foam means that this bed will keep its shape a lot longer than other foams, so you can expect to sleep on this mattress for a few more years. Keeping your RV mattress clean can be a bit of a challenge because you won’t be using it as much as your regular bed (unless you’re a full-timer). Fortunately, that’s not as much of a problem with this model, thanks to the zippered cover on it. With four different zippers (one on each side) pulling the cover off is a breeze, and it will go a long way towards helping you maintain your mattress when it’s not in use. One of the ways that you can tell if a bed is high-quality is whether the manufacturer stands behind it. In this case, seeing a warranty that lasts for three decades should tell you that you can buy this bed with confidence. Although this mattress is going to be much firmer than most of the other models on this list, I like that because then compression won’t be as much of an issue. Also, I appreciate the gel foam top layer, as it will help you sleep cooler at night. The thickness of this bed can be cumbersome, particularly when first installing it into your RV. Also, if your rig doesn’t have sufficient room for this mattress, then any benefits will be rendered moot. If you’re concerned about the environmental impact of buying a foam mattress, then this model from Brentwood Home should help you feel better about it. Because this bed is partially made from bamboo, it’s much more eco-friendly than most. Thankfully, that also makes it even more comfortable as well. As with other beds on this list, this mattress is made of two different layers. I’ve already mentioned my appreciation of gel foam, which comprises the top two inches of this bed. Beneath, you have standard high-density foam, which is more than enough to support your body and help alleviate the issue of compression. When put together, this mattress is both comfortable and sleeps cool. You shouldn’t be waking up because of overheating, and it will adapt to your body shape really well. We’ve already gone over the particulars of the CertiPUR rating, so I won’t dive into it too much here. However, when you couple the bamboo materials with this rating, it means that this mattress is much better for the environment than most of the other options we’ve seen so far. Once again, we have a bed that is built for the RV life. 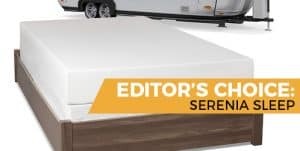 While it’s not always necessary to buy an “RV” mattress, it’s usually much easier to put these beds into your rig because they are cut differently than usual. That being said, you’ll still want to look at the particular dimensions to be sure that this bed will work in your motorhome. Overall, this mattress is a little better than most, thanks to the bamboo cover and the gel foam top layer. I like the fact that it’s made for RVs, as well as that it’s CertiPUR certified. Also, it comes with a remarkable 25-year warranty, so you can buy it with confidence. Unlike the other beds on this list, this model is only available as a queen size. Thus, if you’re looking for a variety of options, you won’t be able to find them. Also, even with seven inches of high-density foam, the center of this bed can compress relatively easily, so you may wind up with a dip in the middle. Although we’ve seen some incredibly comfortable mattresses on this list, I have to say that my top pick is still the Serenia Sleep. Even though this particular bed is thinner than most of the others, it doesn’t have the problem of compression as much as some of the other beds we saw. Not only that, but the combination of layers helps this mattress sleep more comfortably over the long term. Overall, if you’re looking for an excuse to spend the night in your RV, then having this bed inside will be more than inviting enough to spur your next adventure.